We are CLOSED for the 2018 season! 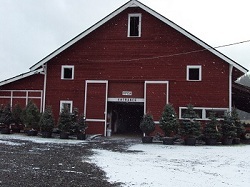 Welcome to the Lochsloy Acres Christmas Tree Farm where finding the perfect tree for your holiday enjoyment helps create wonderful family memories. We are open daily except Tuesdays, starting Nov 3rd -21st for pre-season tree reservations. Come choose your tree when the weather is nicer and you have more time! Check our web site for more details. The regular tree-cutting season starts the Friday after Thanksgiving and continues daily (except Tuesday) until December 9th or we\’re sold out – whichever comes first. We accept cash, checks, Visa and MasterCard. Complimentary hot drinks (with purchase of a tree) in our historic barn will warm you up after you find the perfect tree. Sorry but we have a No Pets policy. Please leave your four-footed friend at home.